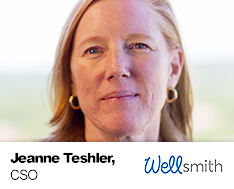 Jeanne Teshler, Founder and Chief Success OfficerJeanne oversees all of Wellsmith’s Client Strategies and the alignment of Wellsmith’s offerings with the clients’ needs. She represents the voice of the consumer in the Digital Health space and is a sought-after speaker and panelist at both consumer and medical conferences. She previously served as Chief Operating Officer of SixDI, Inc., a strategic consulting firm she co-founded with her husband, Yuri, and has over 25 years of experience leading innovation and production teams. Jeanne is always exploring ways to eat healthier, stay fit and often drafts her husband and five children as (willing) test subjects.